John Cusack’s Hot Tub Time Machine…..Worth Every Penny! What I love about Hot Tub Time Machine is that it is a celebration of the best and worst of the 80’s (just like the Wedding Singer which I think is Adam Sandler’s best work, though I am crazy for Funny People too). Hot Tub Time Machine is really an anthem to the 80’s, and who could possibly do it better justice than the iconic 80’s teen John Cusack? Chuck and I were high fiving each other in the aisles because we were loving every minute of the wonderful references to our teenage years. • Of course a character would have to be named Nick because, “He’s your buddy. He’s your pal. You can throw up in the back seat of his car and he doesn’t even care” ala The Sure Thing. • When John Cusack hit’s the slopes, another skier calls out, “gimme my two dollars,” directly from the pages of Better Off Dead. 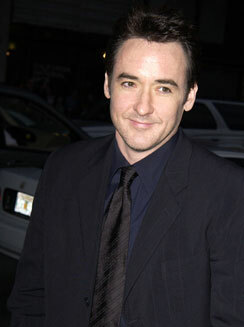 • There is another moment where John Cusack’s character, along with a gal he meets, breaks in to someone’s home. They are sitting on the kitchen counter, cross legged, facing one another, with candles flickering softly in the background, in honor of the famous final scene from Sixteen Candles (while he didn’t have a starring role, and wasn’t in the final scene, it was his breakout film). • What time traveling romp would be complete without paying homage to Back to the Future? Great cameo by the very strange and often creepy Crispin Glover, best known as George Mc Fly. Put on your suit, grab a towel and jump on in. Hot Tub Time Machine is a classic! Our Family Wedding is a stinker, but CineMark has great customer service! Don’t you just love it when you “find” extra time? My absolute very favorite day of the year isn’t Christmas or Halloween or my birthday……it’s the day we celebrate Daylight Saving’s time! Getting that extra hour is such an indulgent treat. As is the case with most busy mom’s, my fantasies revolve around exciting notions like having more hours in the day (oh, and a live in housekeeper and an unlimited budget for nonsense would be good too). Today I was lucky enough to “find” some time with Amanda. She is missing an overnight with her 8th grade class to one of those outdoor education deals because she has her State Gymnastics Meet during the day tomorrow. It is a family tradition, going back several generations, to celebrate “found” time by going to the movies (100 years ago I am sure my relatives were sneaking away from their jobs to watch silent movies with Mary Pickford, Douglas Fairbanks, Sr. and Charlie Chaplin)! With little else appropriate for the eyes of an impressionable teenager, we selected Our Family Wedding. Young love, how sweet. What could be so wrong? This is by far one of the worst and dumbest movies ever made (and I liked Ishtar). I love Forest Whitaker. He was awesome in Good Morning Vietnam and he did just win an Academy Award last year, so I expected something better. I must wonder just how much money they were paying him to make such a stinker. Amanda and I were bemoaning the fact that the movie was pretty bad, but we were holding out for improvement. After we endured about 80 minutes of ridiculous clichés and images flickering across the screen, my daughter turned to me and said, “Do you want to just go?” So we packed up our belongings and darted out of the theater. I was really very irritated. I mean here I was with my daughter, on our day with “found” time, and we squandered it by putting our trust in the studio system to provide us with entertainment. Ha! I told my gal pal that before we left I had to get our money back. The young lady at the counter was quite accommodating when I explained that we had lost an hour and twenty minutes of our lives to this awful movie that we would never be able to get back. Horrified, Amanda turned away and whispered to me, “You’re so weird.” And to add insult to injury the popcorn was stale (even after I drizzled butter on it, which everyone knows should make it tastier). They refunded me the $6.50 for the popcorn too (and they didn’t even bat an eye that we had managed to eat a third of it because we were too lazy to make the long walk back to the concession counter). I must say that I am favorably impressed with the fantastic customer service at the CineMark Theater, which is way more than I can say for Forest Whitaker today. The luck of the Irish…brings spring! Top o’ the evening to ya! Oh, thank goodness for St. Patrick’s Day!! The snow has melted and the sun is shining, spring is on its way (until Sunday when snow is forecasted…but I refuse to believe it for a minute!). I was so inspired by the sunshine that I decided it was at long last time to retire the snowmen. 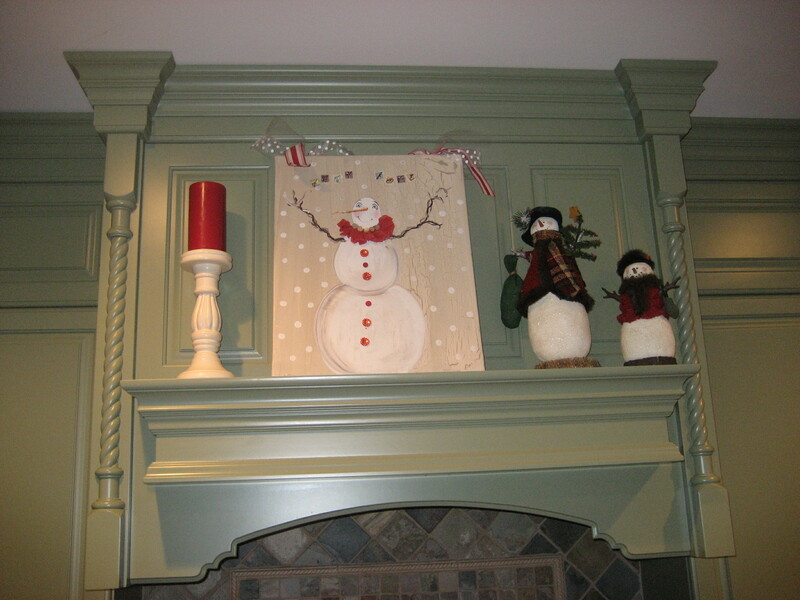 For the most part I prefer snowmen to Santa’s when decorating for the holidays. Santa is just plain silly come January, whereas a snowman is at home until the last snow fall (which in Chicago can unfortunately mean through April. I can’t tell you how many times opening day for the Cubs is endured only with the benefit of down parkas, fleece lined boots and hand warmers in your mittens. Brrr.). Some of my snowmen are especially charming. On the mantle shelf, above the cook top in my kitchen, were Mr. and Mrs. Cute Snow Couple. They are wearing coordinating red nubby jackets, trimmed with faux fur. He is quite jolly with a sprig of mistletoe tucked into his top hat, while she is elegant in her faux fur chapeau embellished with a little bit of holly. For years my pal Judy and I have been going to Christmas at the Faire, which isn’t as much a craft fair, but an opportunity for artisans to display their wares. It’s super fun to attend the preview night. The women come from miles around at 5 o’clock in the evening, on a Thursday night, and the line to get in snakes around the building. Everyone is dressed in their holiday finest as we shop, chat and have what is always a beautiful buffet dinner. We gals will do anything for a night out and these people don’t even serve wine! Though over the years Judy and I have perfected the experience, first by bringing a flask (shopping is so much better with a buzz), and then the past few years by flaunting our bad behavior by bringing bottles that we set out right on the tables. Rebels I tell you! Anyway, three years ago when we were on our little adventure, Judy and I both bought snowman paintings on canvases. Having never hung mine up before (quite frankly I misplaced it in the basement and forgot that I had it), I dusted it off, and found a home for Sally (that’s what I’ve named her) on my kitchen mantle. She was lovely. I am a hoarder of all things, silly snowmen included. 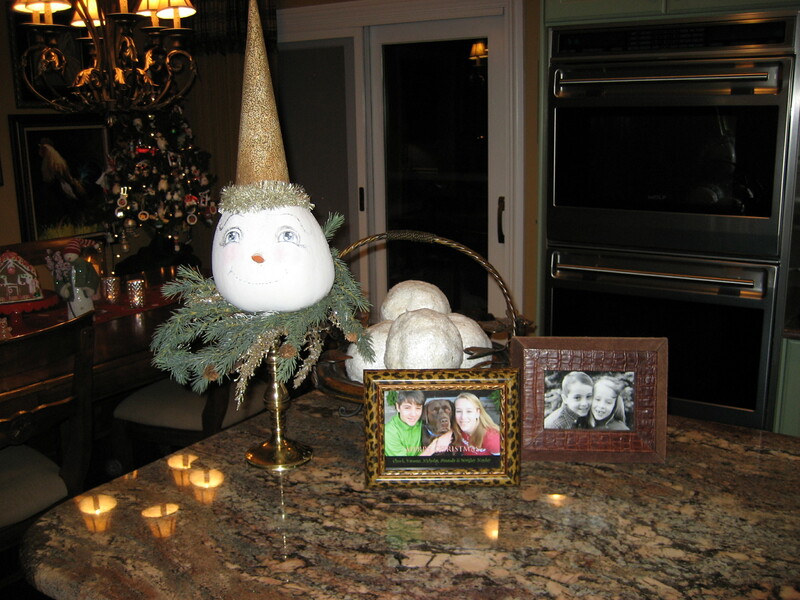 Because I am a gluttonous pig I also purchased this pedestal snowman from the Faire. His name is Fred. He spoke to me because he is sparkly and I am easily distracted by shiny objects. All it takes is a dusting of glitter. What I appreciate about him from a decorating perspective is that he adds height, but not bulk, so we works quite nicely in a grouping. Fred has lived in a number of places. He has been in the Foyer, the Powder Room and now the Kitchen. He really gets around. This year I was loving him on my island as a compliment to an iron basket full of melon sized glittery snowballs. To complete my vignette I framed our Christmas picture, a great close up of Nick, Amanda and Wrigley, and placed it next to our Christmas card from seven years ago which was an equally delightful a close up of Nick and Amanda (two months prior to Wrigley’s adoption). I am a proponent of the close up. Unless you are wearing a fabulous dress, have a great action shot, or are showcasing a landscape, the close up is the only way to go. So, out with the cold and in with the spring! I bought this great oil painting, depicting these sweet bunny rabbits sharing a lettuce leaf last year, but I had yet to find them a home. I think they are perfect on my shelf! To balance out the equation I rested it slightly off center and placed a bird cage candle holder to the right. What I love about the birdcage is that it is tall and slender, so it adds some height, but not so much that it competes with the picture frame. It also brings an airy quality to the vignette because you look right through it. The addition of the candle adds dimension. To the left I have selected a large floral ball. It serves two purposes. The ball in this instance adds texture and the sphere is an interesting contrast to all of the linear objects. 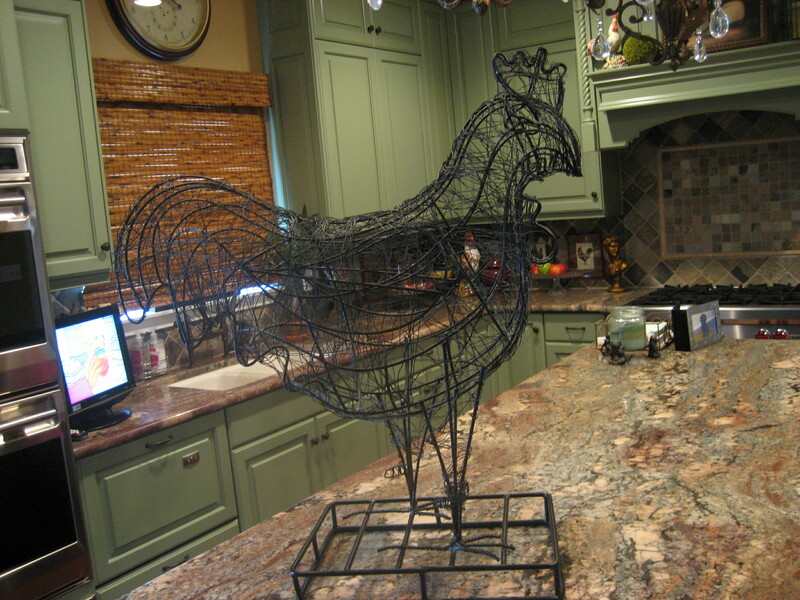 Every kitchen needs a rooster or three (and possibly 14 pieces of artwork too. I’ll have to show you those another day). It’s so very French….. Oo la la! 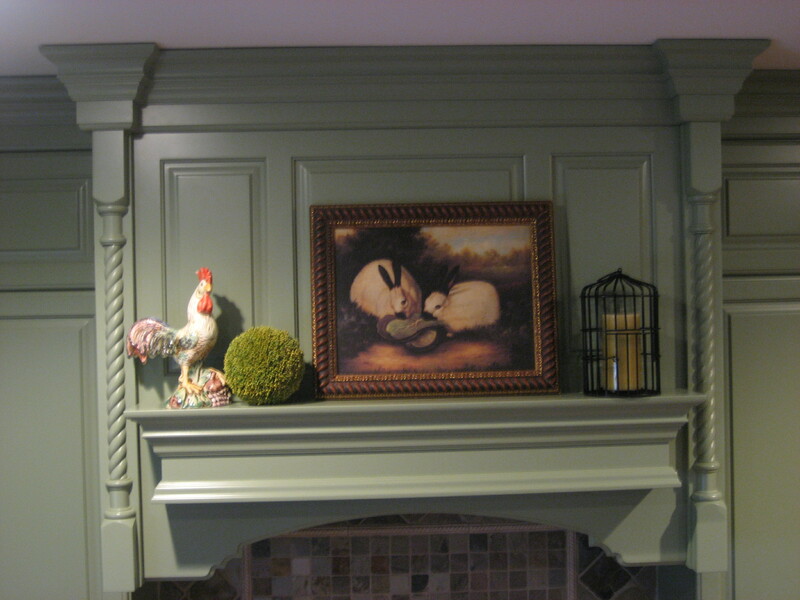 What works so beautifully about this particular rooster is that it is sculptural, for another perspective, it is colorful and works seamlessly with my green cabinets, but it is also linear to mimic the height of the birdcage on the other side. For my personal aesthetic I’m crazy for balance, but not necessarily symmetry. I find that balance provides for a more pleasing display. I’ve never been one for the matchy matchy Garanimals look. I prefer more whimsy in my visual diet. Speaking of whimsy, Target is the single most amazing store ever. High style, low prices. Genius! Several years ago I was cruising the aisles at Target, which is one of my all times favorite past times (Amanda and I were cruising their aisles this very afternoon as a matter of fact. Super cute stuff too. More about that later….). I spotted this amazing wire rooster. It was a seasonal item, intended for the yard, but I saw so much more. In essence this is a piece of art (just because it comes from Target with a reasonable price tag, doesn’t mean we should discard its artistic merit). Elliot (come on, he just looks like an Elliot) stands proudly at 30” tall, which is rather large when anchoring an island. He only works because he is sculpted out of wire, so even though he is huge he maintains a light, aristocratic quality. All this spring talk makes me want to buy flowers, but I guess we’ll have to wait a little bit longer. You know how the saying goes…..April showers bring May flowers. Happy days, we’re almost there……. Whoever said, “It is better to give than to receive,” is a big fat liar. As the More is More Mom® I can tell you with certainty that everybody loves to be on the receiving end of a beautifully wrapped package. Gift giving is truly an art form. 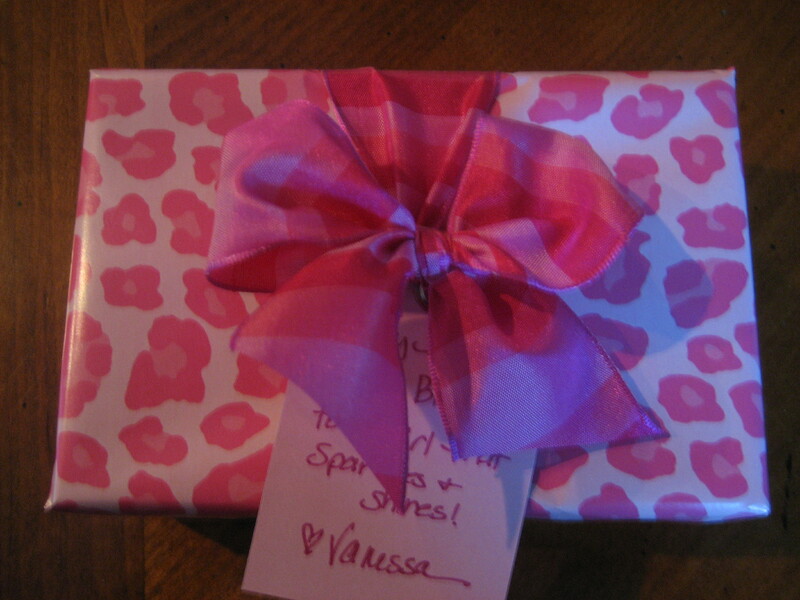 When in doubt….. BRING A GIFT! I can scarcely imagine an event that would not be improved with a token of affection. Why just this past week I was included in a get together for a friend whose company I enjoy very much, but don’t know particularly well. It was a cocktail and appetizer girl’s night out, where the girls pitched in for the fun. I have a general rule of thumb which considers reciprocity as a guide for the type of gift that is appropriate. For instance, in this case the girls were contributing to the cost of the evening, and the guest of honor was an acquaintance, therefore a whimsical treasure was in order. The birthday gal in question is the beautiful, glamorous, out going type, so really, what is there possibly left to get for the lady that has everything? I searched and I pondered until I came upon the perfect little gift. 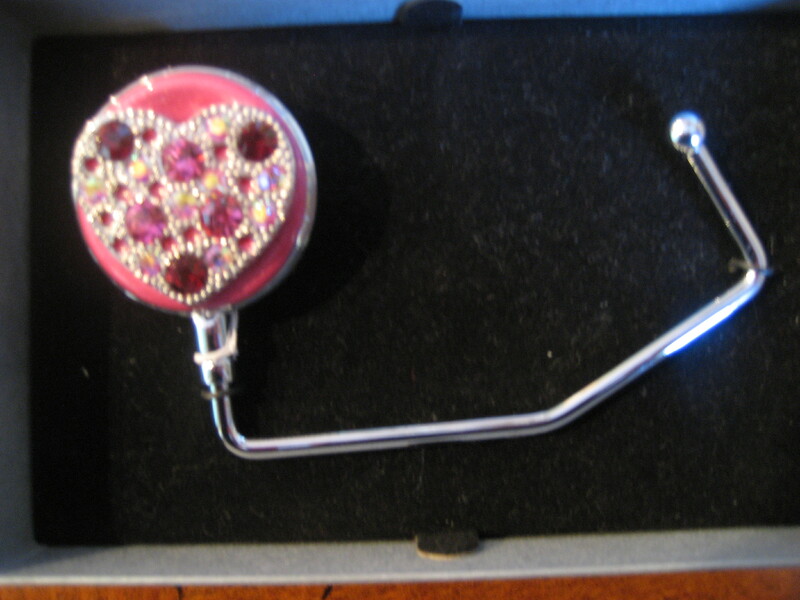 I found a heart shaped, pink and silver rhinestone studded, purse holder. It is a handy little gadget that fits on a table top, and dangles a hook from which to hang your purse while you are out for the evening (rather than setting it on the yucky, skanky floor). The message I wrote said: Happy birthday to a girl that sparkles and shines….. The perfect accompaniment to a thoughtful or meaningful gift is of course in the way that it is presented. As the More is More Mom® I am a collector of many things which would include……….wrapping paper, gift bags, tissue paper and ribbon! The well appointed gift giver is excessively well stocked with; tape, invisible, double sided and packing; scissors with straight edges, pinking sheers, and specialty edges with curly cues and zig zags; beautiful and colorful wrapping papers, in an array of patterns and colors to fit every conceivable event and occasion; gift bags of every shape, style and size; a rainbow of tissue paper, and plenty of classic white; and……ribbon. I don’t even know where to begin describing the ribbon. I have several Rubbermaid containers full, jam packed and over flowing in colorful and fanciful reams. I purchase most of my ribbon assortment from Cost Co (though I am a lover of ribbon from Jo Anne Fabrics and Hobby Lobby, too…how those people stay in business I’ll never know. Their inventory is not computerized and something is always on sale for 50% off. I LOVE IT!!). I am also quite partial to gift tags, note cards and stationary; and of course multi colored felt tipped pens and Sharpies. Like a good Girl Scout, I am always prepared. 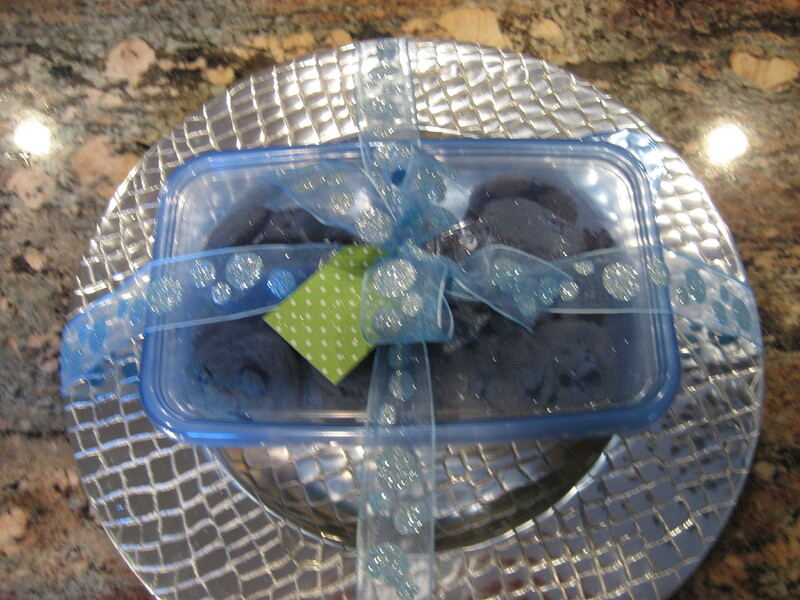 I am a big believer in Hostess Gifts….because I always want to be the first guest invited to return! If your host’s have gone to the trouble of inviting you to their home, then you are obligated to show your appreciation by bestowing upon them a gift to thank them for their hospitality. To host a party or an event, big or small, is very time consuming (requiring an insane number of hours of preparation) and can be rather expensive. I like to consider the investment of generosity (thoughtfulness, time and expense) involved in including me in a celebration as I determine how best to thank my host’s. Over the past few weeks I have been invited to a few fun events. For the first one, Chuck and I were invited to join our host’s at a fundraiser for a very worthy cause. We were their guests, so two days prior to the event I made them a batch of chocolate chip cookies (Glad makes these great disposable containers with lids, which I like because they keep your baked goods fresh and safe from harm, like Wrigley stepping on them in the car, and the message is clear that nothing needs to be returned to you) for their family and I wrapped them in a beautiful ribbon around a silver platter, which was the real gift. I brought it to their home in advance of the event so they knew that we appreciated being invited as their guests, and were looking forward to spending the evening with them. Rather than bring the gift the evening of the party, I brought it to their home so as not to burden them on that evening at an offsite location. Then, I was lucky enough to have two fun things to do in the same day! My book club has decided that while school is in session we will meet during the day for lunch, rather than in the evening for snicky snacks and splishy splashes of wine. Evenings are tough during the school year with homework, sports and traveling husbands. However, evenings in the summer are a refuge from the madness of the bustling days. In February we read The Reliable Wife (which was curiously somber and strange) and were treated to a beautiful luncheon in my friend’s home. Oh, how I wish I had brought my camera. Everything was beautiful! On her kitchen table was a lovely floral tablecloth, set on the diagonal, with rows of wine glasses, water goblets, and coffee mugs, and an urn used as an ice bucket. The lunch was delicious! An enormous green salad, with strawberries, nuts and crumbled cheese topped with sliced grilled chicken breasts, fruit salad, rolls and mugs filled to the brim with asparagus soup. It was apparent that so much care and effort went in to planning and preparing this luncheon. I brought a festive spring platter with a small rabbit in the pink center of a platter edged in a spring green. My friend has two boys, so I made them each a sleeve of chocolate dipped pretzels with pastel sprinkles. 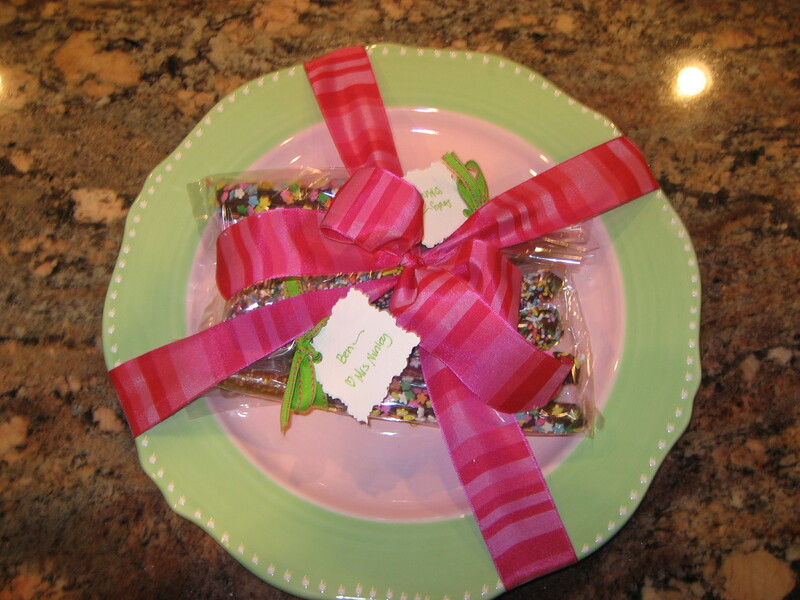 I fastened each bag to the platter with double sided tape and wrapped them up in a big pink striped bow! Our Lady of Perpetual Donations was in need of more…..donations, for the annual gala auction. The auction committee customarily asks the eighth grade families to donate a basket and a few of my gal pals agreed to spearhead the project. They had a fantastic idea: Hold the event at a cute little shop in downtown Winsome (……where winning is a way of life) that sells hip and happening clothes, and fun and funky jewelry. Ladies love that! A night out for a good cause, with wine and snacks, and the opportunity to purchase sparkly baubles! The girls were great to put together a fantastic event for a good cause, and I wanted to get them each a token to thank them for their generosity. I found three of the sweetest pedestal plates with little pink, yellow, green and blue chicks dancing around the rim. 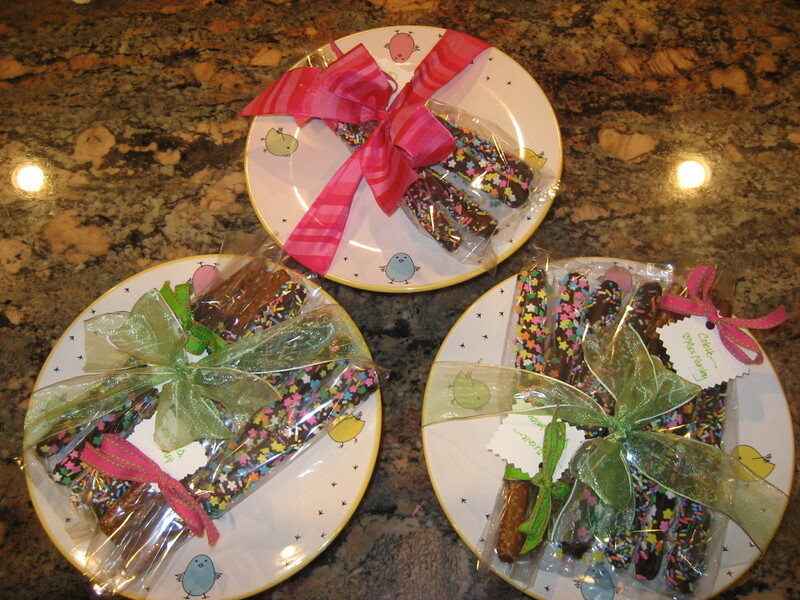 I had quite an assembly line of chocolate dipped pretzels, in individual sleeves, for the children in each household. Many thanks to the “smart-icles” (as Amanda would say) at 3M for the invention of double sided tape, as I once again taped down the sleeves of pretzels to the pedestal platters and tied them with a big bow. What’s the best way to spend Casmir Pulaski Day? 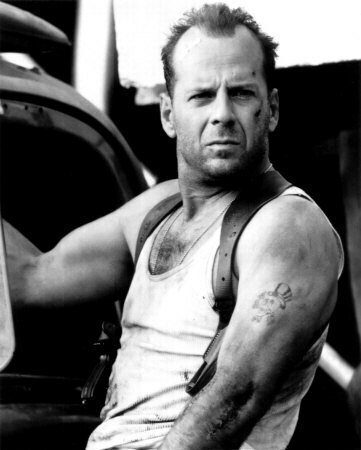 Why with Nick and Bruce Willis of course! This has been such a long and sad week. My computer had a nasty virus and I haven’t been able to chat with you all week. Thankfully the smarties at Office Depot were able to straighten out the problem and I brought it home today! It’s probably just as well anyway because we have been to Milwaukee for a gymnastics meet and up to our eyeballs in hockey playoffs. Shoot, pass, kick some……. Well, you can imagine the rest. Last Monday I enjoyed the best Casmir Pulaski Day ever…..I spent it with my son Nicholas. The Be All and End All Academy, where Nick is a junior is High School, had the day off of school in honor of Casmir Pulaski ( a cavalry officer born in Poland, celebrated for his contributions to the US military during the American Revolution…thanks Wikipedia!) Teenagers are very busy creatures and I welcome any opportunity to have extra time with my fella (other than the super fun hours I spend nagging him about; homework, putting away his laundry, the trail of discarded clothes and candy wrappers, the 13 separate glasses he uses each day for orange juice, his beverage of choice, and abandons wherever he happens to be at the moment, which are scattered about the house…you know, the usual). Nick is the best, and I’m not saying that just because I’m his mom. When he is not performing his obligatory duties as an irritating teenager, this kid is amazing. He is perfectly sweet, compassionate and charming, polite and respectful, hard working and dedicated, and not too bad on the eyes. He is one witty and funny son of a gun. He has a wicked sense of humor, occasionally out of line and inappropriate (though I have never been too terribly concerned because I believe it is easier to temper spirit than it is to inspire it), and anyway, that’s what letters of apology and flowers are for (teachers…… you know who you are. He has his own stationary and the phone number of a good florist). He has great delivery and impeccable timing, and if you can’t tell, I’m over the moon for him. One of the best things about Nick is that he is passionate (and perhaps a bit obsessive….you know the story….apple….tree) about everything he does. I suppose he is a More is More kind of young man……more hockey, more rollerblading and stick handling (hockey practice in my house), more working out, more golf, more chocolate, more smack downs with his sister, more noise, more chaos and more fun! One of the other things I love about my Nick is that he is a total gamer. He is always up for doing things. When he was little he would wake up in the morning and ask, “What do I get to do today?” I love that! He views life experiences as opportunities. This past Thanksgiving he was up with me at 6:30 AM (on a day off of school) to accompany me and my girlfriends on a 5 mile Turkey Trot. Christmas morning he was happy to join me on our own Reindeer Run, and we welcomed in the New Year with a 5 mile run with our baby Wrigley. I consider myself fortunate to have a teenager that is such good company. I was just thrilled to have an unexpected afternoon with him. I know that’s totally sappy. I cry at commercials too. Boo hoo. We decided to celebrate Casmir Pulaski Day by heading to……the movies! Going to the movies is one of our favorite family past times. William Powell (the old actor from the 30’s and 40’s) is our all time favorite actor, and our Nick is named for the character he plays in The Thin Man: Nick Charles. In fact, our very first apartment was in the South Loop, in a building that housed five movie theaters. It was awesome. Sometimes Chuck would stop in on his way home from work just to buy popcorn. We decided it was time to move when there was a gang shooting in front of our building while they were playing the movie Color’s with Sean Penn and Ice T. What can you do? •	Crazy Heart…..or, as it should have been called, Crazy Boring. Jeff Bridges turned in a stellar performance as always (hence the Oscar), but it was a dull country/western version of last year’s The Wrestler, with Mickey Rourke (who is crazy) which was actually amazing. •	Valentines Day…..how could it possibly have been any good with that many stars? Ashton Kutcher, cute as a button. Jennifer Garner, dimples for days. PG-13? I think not. On a precious day off of school, Amanda and I went to lunch and a show with a gaggle of mothers and daughters. The mothers were absolutely cringing as a teenage couple was planning the first time they were going to have s-e-x right in front of our daughters. Eeew! Where is a good Disney picture when you need it? So by now Cop Out was looking pretty darn good. But do you know what the best part of Cop Out was (other than the totally cool Bruce Willis)? …. Getting to spend the day with my Nick. 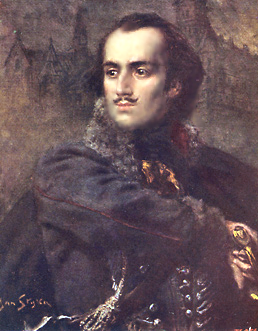 Thanks Casmir Pulaski!